As State-led centenary commemorations take us through the War of Independence, the RTÉ series The Irish Revolution has recently brought the period to life on our small screens. The series is based on the immense historical work contained in Atlas of the Irish Revolution, the ultra comprehensive and weighty tome published last year by a panel of leading historian editors. Atlas contains more than 1,000 pages, with over 300 maps and it weighs 5kgs. So weighty indeed. And it has been hailed as revolutionary. In late 1921, the six, who were accompanied by their officer Sean Moylan, headed up to Dublin during the ceasefire preceding the Treaty. Keating had asked his friend Moylan if he could paint his men at his studio at the Dublin Metropolitan School of Art. This ominous and presumably heavily armed crew had the porter worried when they asked for Keating. The former thought the artist was about to get a bullet. In the end however, Moylan (later the Minister for Education) would not sit, for fear that the Treaty would fail, the war resume and he could easily be identified from it. However, the other six, Jim Riordan, John Jones, Denny O'Mullane, James Cashman, Dan Brown and Roger Kiely, all agreed to pose over a two-week period. The artist deliberately depicted them older than they were at the time, perhaps to help protect their identities. But just months earlier on June 1, Major Charles Purdon Coote of Bearforest House in Mallow, Co Cork, a British war hero and a loyalist, had received a far more sinister visit from 2nd Battalion IRA. They called at his beautiful Morrison-designed country house just outside Mallow carrying petrol. Bearforest became one of the 'big houses' burned by the IRA during the war, in counter reprisal for the British burnings of homes. Almost 100 country mansions were torched in the War of Independence and almost another 200 followed them to ashes in the Civil War that came after. They were a huge loss to the nation in terms of workmanship and art works and cultural heritage lost. Today the surviving country houses are a key hub in rural and town life, hosting concerts, fairs, conferences, weddings and events. But in '20/'21 they were burned, even when their owner (largely the Anglo Irish class), were not considered a threat to the guerrilla forces; or in some cases were even sympathetic. Bearforest was one of the first to go in the June 1921 spate. In the same week, the IRA 2nd Battalion also burned nearby Cecilstown Lodge, Newberry Manor and Castle Cooke. The pattern was standard. They arrived in the early hours of the morning. The family were awakened and given time to leave the property. Usually they were assisted in removing key possessions. Then the assailants walked through spilling petrol. While most occupants were left unharmed, violence sparked when the owners resisted. While 80pc of the big houses burned in both wars were permanently abandoned as shells, Bearforest is among the special 20pc to have been rebuilt and saved. Colonel Purdon Coote, an enthusiastic cattle farmer who had been awarded the Belgian Croix De Guerre for bravery during the Great War, stuck around and had the house restored by 1925. As if to reinforce his intentions, the colonel also added a third floor while he was at it. And so it was that Irish Independence made Bearforest bigger. The colonel remained resident, resumed breeding his highly regarded British Friesians and continued to be a prominent feature at the local fairs and cattle marts until he passed away in the 1950s. In the 1970s, the historic house was acquired by an American based couple, Charles Moore from Connecticut and his wife Sheila (nee Digby), the latter being the daughter of the 11th Baron Digby. The Moores gave Bearforest an intensive revamp and also founded a stud farm here in 1972. In the years until her death at 92, Sheila Moore spent her time between Atlanta and Bearforest and was known fondly in bloodstock circles where all knew her policy to be: "race the fillies and sell the colts." Among Bearforest's brood have been Ballyoisin, Notcomplainingbut and the hurdlers Asian Maze and Force Seven. Now following Sheila's passing in 2014, the house has been placed on the market for the first time in almost 50 years by the Moore family, seeking €950,000 through Sherry FitzGerald, Christies and the local agency Sherry FitzGerald O'Donovan. What we have in Bearforest today is a Regency-era Morrison with a distinctive bow front and a far more youthful Arts and Crafts heart beating inside, thanks to that 1920s rebuild. This puts this old Regency home at an advantage compared with survivors of the same era, whose support beams have often succumbed to two centuries of assorted rots and ails. The house therefore remains period, but for the modern era. And given its location near Cork Airport, it also represents a solid 'big house' option for returning UK emigrants seeking to involve themselves with horses. Indeed it also suits the new wave of Brexiting Brits with no Irish connections who want to move into the EU, while remaining a short flight from the soon-to-be Brexited mother ship. With London's property market teetering into downturn, which some predict will be hastened further by the UK's eventual EU departure, many relocators are considering it to be a good time to move. That said, selling agent Rosanna De Vere Hunt, one of Ireland's most respected country house real estate experts, still thinks that a US buyer is slightly more likely for the Bear. With Bearforest, Richard Morrison was specifically asked by the banking magnate Robert Delacour to create a large but modest and elegant house on the lands formerly held by the Beare family (it was once spelled Beare Forest). The house was completed in 1807/08 for the Delacours who then owned 4,500 acres locally. Bank boss Robert wanted a big house but didn't want to show off with it. Morrison described his intentions to design "a residence that should combine simplicity and elegance for the purposes of a large family, or of affluent fortune, while it retained the modest character of becoming the habitation of an unostentatious private gentleman." So while the Regency Jones's were going all out to dazzle with Palladian columns and Corinthian whatnots, Delacour was keeping it cool and svelte. Much like the Chambers designed Casino in Marino, there's a degree of tromp l'oeil deployed here, to make what is a quite large house by Irish standards look modest as requested. Internally it holds almost 9,000 square feet of accommodation - the equivalent of an entire cul-de-sac of eight modern three-bed family semis. The house is arrayed over three floors with a round cornered entrance hall, a sitting room, a study and a formal dining room which in turn links in to the drawing room, the largest room in the house. To one side is a kitchen and breakfast room in the traditional style, a pantry, utility room and a garage. There's a guest wc off the back hall and the house has a grand staircase from the main hall as well as a servants' stairs to the back and side. On the first floor are five bedrooms, including the master chamber with its ensuite and a private dressingroom. There are two other ensuites. The top floor of the house has the balance of its nine bedrooms with a plant room, three store rooms and an additional bathroom. The rented gate lodge has three bedrooms, a living room and kitchen/breakfast room. Of interest to those with equestrian intentions is the courtyard, entered via a period stone arch. This comes with a coach house, stables and a self-contained groom's apartment. There's also a decent tract of woodlands and a salmon hatchery on the lands which are largely in post and rail flanked paddocks. It has expertly clipped formal gardens and an old Victorian walled garden of over an acre, as was traditional in the Big House of old. Bearforest is on offer for €950,000 with 20 acres, the lodge and courtyard, but another 32 acres is also available from the estate. This is rezoned and a low density residential scheme might be permitted. The price for this tract is circa €3m. 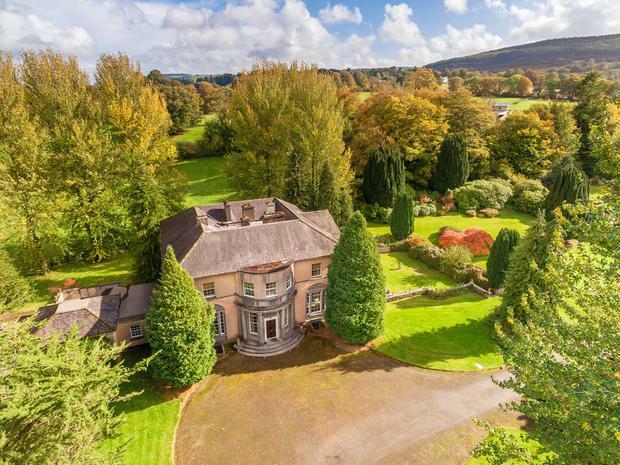 For the house on all 52 acres, offers are expected at just under €4m. Otherwise €950,000.